NJB Article and Source Repository: The End of Palestinian Nationalism. By Liel Leibovitz. The End of Palestinian Nationalism. By Liel Leibovitz. 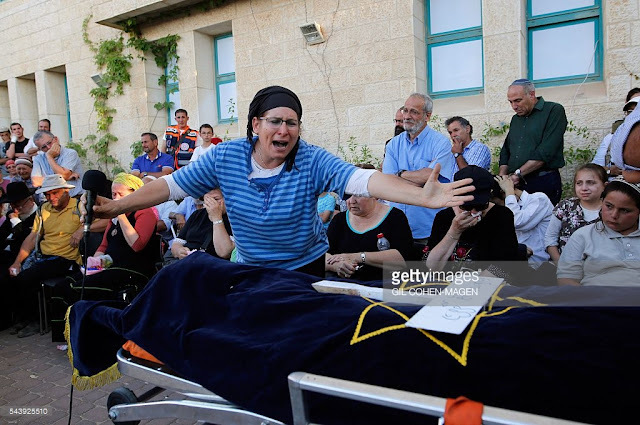 Israeli Rina Yaffa Ariel, mourns over the body of her daughter Hallel, a 13-year-old girl who was fatally stabbed by a Palestinian attacker in her home, during her funeral in the Kiryat Arba settlement outside the Israeli occupied city of Hebron on June 30, 2016. The Israeli army said that a young Palestinian killed Hallel in her bed after breaking into her home in the Kiryat Arba settlement outside the flashpoint city of Hebron. Security personnel rushed to the house and fired on the attacker, who wounded a guard before being shot dead, the army said. The girl was taken to hospital in Jerusalem in critical condition and died of her wounds. Getty Images / AFP / GIL COHEN-MAGEN. The End of Palestinian Nationalism. By Liel Leibovitz. Tablet, July 5, 2016. When a movement devolves into a death cult, it’s time to rethink our assumptions. With the Israelis murdered this week by Palestinian terrorists—13-year-old Hallel Ariel, stabbed in her sleep, or Michael Mark, father of 10, shot in his car with his wife and children by his side—it’s also time to bury the bloated corpse of the Palestinian national movement. A cause that had once attracted the sympathies of just and compassionate people everywhere is increasingly devolving into a call heard only by the wild and the deranged. How did that happen? Like all questions of its scope, this one, too, contains multitudes. You could argue pragmatism and say that it was Israel’s fault, that the Jewish state’s stringent policies and its penchant for settlements drove the fragile Palestinians to despair. You could argue essentialism and say that it will always be in the Arabs’ nature to hate the Jews. There’s no shortage of good stories to tell, and all likely contain some dusting of the truth. But none explain 17-year-old Muhammad Nasser Tarayrah taking a smiling selfie and then leaving his luxurious two-story house in Bani Naim, ambling over to Ariel’s home in Kiryat Arba, watching her as she slept peacefully in her bed, exhausted from a dance recital the evening before, and slaughtering her with a kitchen knife. None explain Tarayrah’s mother and sister hailing the murderer as a hero who has made them proud. This is not nationalism. It is madness. And yet, don’t expect the arbiters of global rectitude to pay much attention. The world, moved both by moral rightness and political necessity, has gotten used to holding two opposing narratives about the Palestinian national movement in its head at the same time. The first of these—some versions of which are inclusive of Israeli rights and aspirations, and some of which are entirely hostile to the existence of Israel itself—is about the right of the Palestinian people to their own state. The second is about the wrongs committed by both Palestinians and Israelis, and which tend in the minds of most reasonable people who are not deeply staked in the tangled history of the conflict to drown each other out: Oppression leads to terror attacks which lead to more oppression. This clash between narrative A (the Palestinians deserve a state) and narrative B (bad deeds on both sides make a Palestinian state more and more unlikely) is frequently referred to by Western reporters and diplomats, usually with a schoolmarmish clicking of the tongue, as the “cycle of violence.” If only both sides could get along, the common wisdom among the global elites still runs, it would be easy enough to find some sort of solution, and the world would be at least a moderately better place. But what if both narratives of rights and wrongs are in fact inseparable? That’s what the leaders of the BDS movement believe. In their view, the deeds of the occupation they decry are hardly an accident, because all of the land of Mandate Palestine properly belongs—by transcendent right, if not by international law and treaty—to the Arabs of Palestine. Compromise with Zionism is a compromise with inherent oppression and injustice, which by its very nature will only inflame further conflict. The only morally right, and politically stable long-term solution, therefore, is to eliminate the Zionist State of Israel, once and for all, even if both Zionists and devotees of international law might read the historical record and the facts on the ground very differently. The great virtue of the BDS position is that it replaces contradictions with clarity: Zionism is occupation, always and forever, plain and simple. It is worth considering whether the leaders of the BDS movement have stumbled on something profound about the conflict, a premise that people in the West who oppose the elimination of the State of Israel might also want to consider. Maybe it isn’t true that both sides are right. Maybe the easy nostrum that both national movements have justice on their side and that both sides do bad things is a false appeal to complexity of the kind that comforts people who would really rather not deal with hard real-world questions of right versus wrong. Maybe the failure of decades of painstaking but fruitless efforts by the most sophisticated diplomats and map-makers and negotiators on the planet, backed by unending rivers of cash, is telling us something important: that there isn’t room for two full-fledged national movements in the same tiny sliver of land, even if, in a perfect world, it would be better if there was. What if what you see on both sides of the Israeli-Palestinian conflict is what you get? Then what? It is in fact impossible to separate the Zionist dream of creating a Jewish nation-state in the Biblical land of Israel from the abridgment of the national aspirations of those Arabs who were previously living in that land under the Turks, or who were drawn there in growing numbers in the early 20th century by the economic activity of Jewish colonists. In that sense, while Zionism doesn’t have to—and should never—imply that non-Jewish citizens of Israel do not have absolutely the same rights as Jewish citizens to live, work, think, and speak freely, the BDS movement is certainly right that Zionism absolutely does imply the abrogation of the national dream of the Palestinian people to enjoy the whole of historical Palestine as their national homeland. It is perfectly fine for some Palestinians to see that abrogation as a burning injustice, and to reject Zionism as a cruel, unjust imposition on their own experience, just as Zionists are free to celebrate the return of the Jewish people to its historic homeland, and wish that all the Arabs would pack up and leave. Whether settled in courtrooms or on battlefields, it is an argument that, really, only one side can win. By the same token, it is also time to see the Palestinian national movement as a unified whole, rather than picking and choosing among its parts in order to construct a Western-friendly creature that can then be positioned as a likely partner for negotiations that—for reasons that should now seem obvious to every thinking person—go absolutely nowhere, because they are premised on a fantasy of a thing that doesn’t actually exist. Is there actually any meaningful difference in the aspirations of the leaders of Hamas and the leaders of Fatah, both of whom compete to incite and lionize the unending stream of zombie-like killers who murder Jews wherever they can find them, whether in settlements or on the beaches of Haifa and Tel Aviv? These killers, and the leaders who incentivize them, are not something separate from the Palestinian national movement. They are, as the wall posters and the television broadcasts in their honor claim, the front-line soldiers of the movement, and its purest representatives. And that’s the real catastrophe facing the Palestinian people these days. There are plenty of other nations created by colonists on occupied land—America, Canada, Australia, New Zealand, and all of Latin America come immediately to mind, even if none of the Europeans who forged new nations in those places had even the slightest historical connection to the lands they seized. And there are some examples of national movements pushing off their oppressors and winning back their ancestral homelands. There are, however, no examples of nations, even failed ones, created by death cults. And a death cult is just what the Palestinian national movement has now become. The Palestinian genius for nay-saying is well-documented, but what’s at play here is something new, something that transcends the dull boundaries of international negotiations and seeps into the hearts and minds of the young. Once the essential No that has guided Palestinian policy for decades has been turned inward, it could find no other outlet but destruction and no better target than the Jews next door. Anti-Semitism has something to do with fanning this derangement, but it is not its essence; neither are pure yearnings for an independent Palestinian homeland. The revolt we’re seeing now is more profound, more ontological in nature: It’s the revolt of an educated and relatively well-off generation—note how many of the stabbers have come, like Tarayrah, from comfortable and stable families—that looks for meaning and honor and sacrifice and can find it nowhere in the vastly compromised world outside, succumbing instead to the all-consuming fire of utter annihilation. We’ve seen this tide rise before under similar circumstances, and we’ll see it rise again. It’s easy to argue that Tarayrah and his fellow pogromists are merely youth pushed into murder by the constant torrent of incitement prevalent in every corner of Palestinian culture; this is true, but it eerily assumes, like the looniest moralists do when they argue that violent video games or gangster rap will inevitably lead to shootouts in the streets of suburban Connecticut, that adolescents are spongy creatures incapable of doing much more than soaking violence and spurting out violence in kind. It’s even easier to continue to blame that mythical horned beast, the Occupation, as if there was no other reason for young Palestinians to feel hopeless—like, say, the fact that their own government is one of the world’s most repressive and corrupt—and as if hopelessness necessarily translated into taking knives to the throats of slumbering children. If we abandon these simplicities, and acknowledge instead that what bedevils Palestinian society is a much more wicked problem, we’re left to make some uneasy decisions of our own. First, we should realize that we must approach a death cult differently than we would a healthy national movement. The latter calls out for compromise. It rewards negotiations, and it reassures its foes by offering indications, real and symbolic, that future reconciliation is likely and at hand. This is why we often forgive it its missteps, and are willing to look away even when it occasionally unleashes bloody hell, as even the most well-tempered and responsible national movements sometimes do. The former, however, has no appetite for anything but destruction, and measures its triumphs with the crude arithmetic of body counts and death tolls. It cannot be reasoned with. It can only be forcefully stopped. Until it is, any attempt to pretend that Palestinian nationalism is still viable is simply grotesque. This should come as little surprise to any serious student of national movements throughout history. Reread Herder’s remark that, in a certain sense, every form of human perfection is first and foremost national in spirit, and reflect again on the Treaty of Westphalia, which sliced Europe into nation-states erected on the basis of self-determination and committed to diplomatic congress as a means of resolving disputes. Then go forth and observe the myriad national movements that failed miserably to live up to this new spirit of creative nationalism. Ask the Moravians or the Transnistrians about their efforts at self-determination, and that’s just one small corner in Europe. The world is thick with failed national movements that, for one reason or another, saw their dreams disintegrate into violence, or irrelevance, or both. Sadly, the Palestinians now join them. This will have many implications, for Palestinians and Israelis alike, but if history is any guide, the only way to counter a No is with an equal or greater Yes, a spirit that meets death by loudly and enthusiastically affirming life. The Trumpen Proletariat. By Daniel Henninger.